Our site has presently been relocated to nusgeographicalsociety.com. 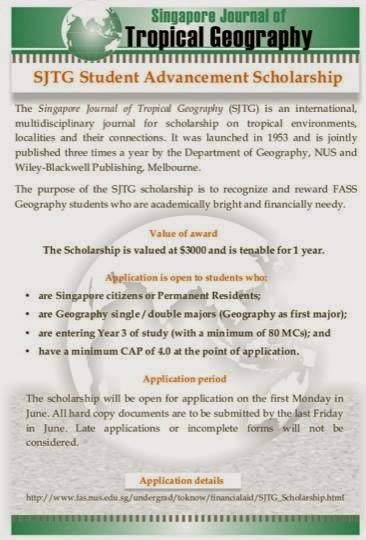 We kindly invite you to apply for the Singapore Journal of Tropical Geography Scholarship for this year! Every year since 2013, the SJTG Scholarship has recognized an FASS Geography student who is academically bright and financially needy. in June. Late applications or incomplete forms will not be considered. The Scholarship is valued at $3000 and is tenable for 1 year. have a minimum CAP of 4.0 at the point of application. The 2nd Majors' Welfare outing is finally here! The school holidays are just around the corner and why not spend it learning while having fun? 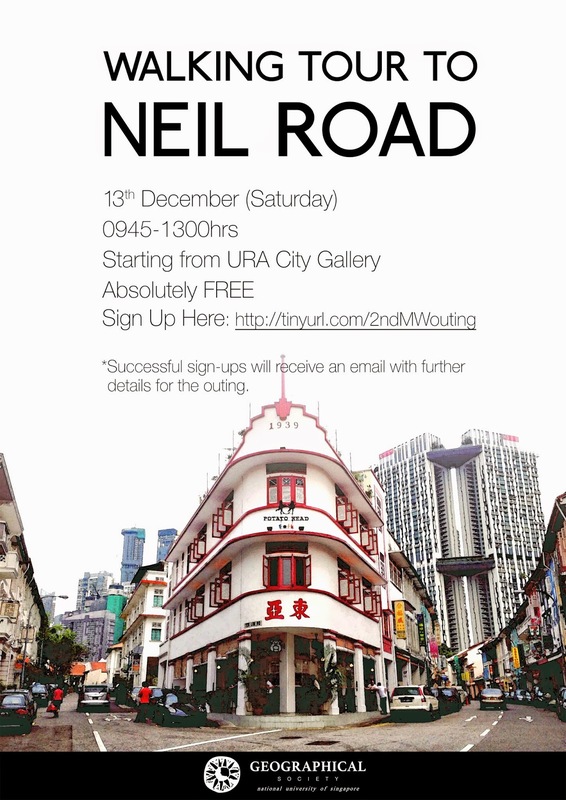 Come join us for a walk down memory lane to some of Singapore’s iconic & well conserved heritage buildings! With the help of tour leaders from the Urban Redevelopment Authority (URA), don’t miss this one-time-only, enjoyable and educational Majors’ outing! Please refer to the poster below for more details. Have a great exam week! Hope all your finals preparation is going smoothly Just a heads-up, the annual Geographers’ Chalet will be held from 7 Jan (late afternoon) to 8 Jan 2015 (noon) at NSRCC Tanah Merah! It’ll be a great opportunity for you to bond and chill with fellow Geographers before we head into the new semester. More details will be posted after finals, but do keep those dates (7-8 Jan) free! Looking forward to seeing you there, but meanwhile...ALL THE BEST FOR FINALS! 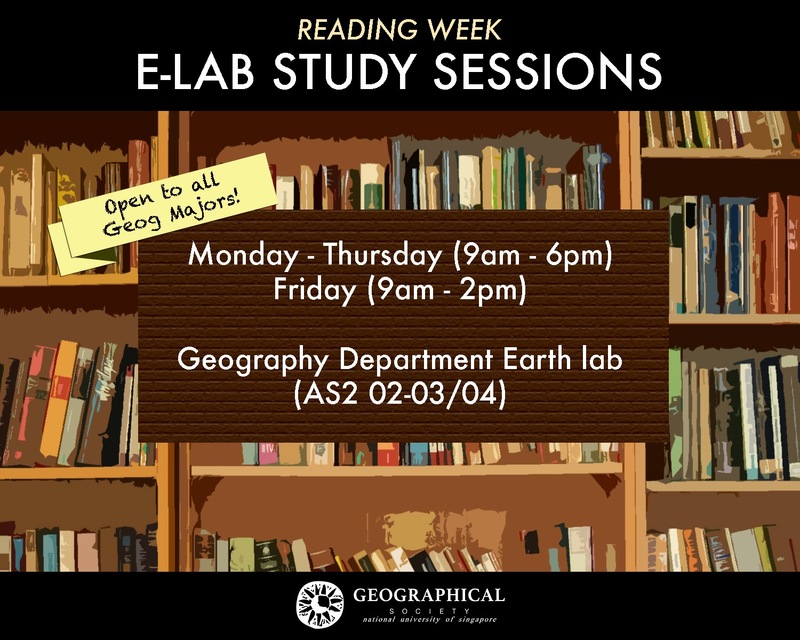 Hey all, if you're looking for a nice, conducive place to study during the upcoming Reading Week, the Earth Lab will be open to all Geography Majors from Monday to Thursday (9am - 6pm) and on Friday (9am to 2pm). The use of the Earth Lab will only be open to Geography Majors only and we seek your understanding and cooperation in complying with this rule. All Earth Lab rules and regulations apply at all times during the study sessions. The GeogSoc Management Committee Member(s) present will also have the right to request violators to find alternative study venues. To everyone who has placed orders for Majors T-Shirts 2014 – THEY ARE HERE! For those who paid via cash at our payment collection booth 2 weeks ago, you should have been issued receipts. Please kindly bring them along as verification when you come to collect your T-shirts. For those who paid via bank transfer, please inform our friendly MC members on duty about that. We will verify accordingly before passing you the shirts. Should you be unable to collect your shirts during the above timeslots, you may ask a friend to help you collect. If this is really not an option, please email geogsoc.specialprojects@gmail.com and we can work something out. Our friendly Geog Soc MC members will be there to collect your payment and assist you accordingly. Each shirt costs $10. We would greatly appreciate it if you can bring an exact amount to facilitate the collection process. Should you be unable to make payment during the above timeslots, you may ask a friend to help you make payment. If this is really not an option, please send me an email at geogsoc.specialprojects@gmail.com and we can work something out. For alumni who have ordered the shirt, we will be contacting you about separate payment collection details. Also, walk-in orders will take place this year! So no worries if you missed the online orders! Simply come down to our payment collection booth at the stipulated dates and times, bring your payment, and inform our friendly Geog Soc MC members on duty about your orders. We will note them down accordingly. Once again, please note that the payment collection of the Majors' T-shirts will take place on 21 October (Tuesday) and 23 October (Thursday), 10 am – 6 pm, at benches outside LT11! We are pleased to announce the Majors’ T-Shirt for 2014: Geography – National University of Singapore (with the urban skyline), which has emerged tops in the voting! The winning designer, Haizer Sidik (Year 2, Geography), will walk away with a complimentary shirt and $20 Starbucks voucher. 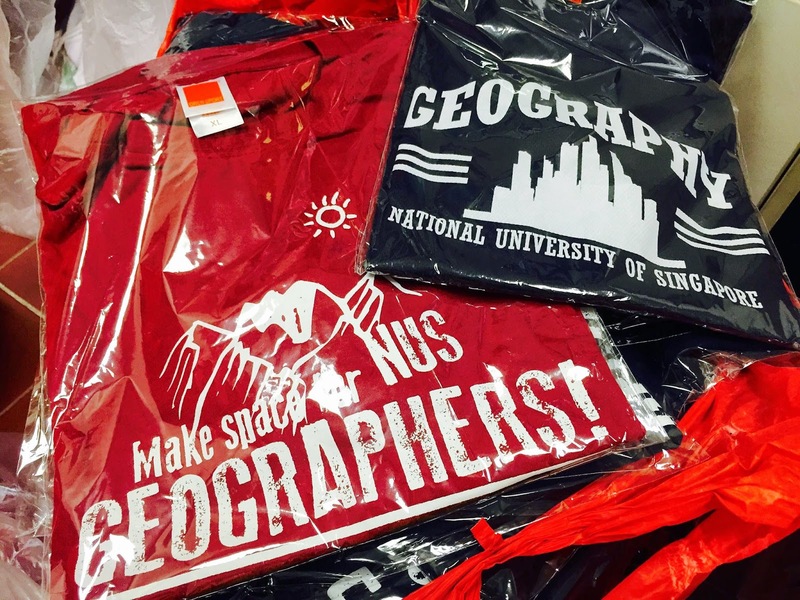 The colours available for the Majors’ T-Shirt 2014: ‘Geography – National University of Singapore’ are navy, maroon, milo green and black. They can be viewed at http://postimg.org/image/6ga32vp4j/. Also, due to popular response, we will be reprinting the Majors’ T-Shirt for 2012: ‘Make Space for NUS GEOGRAPHERS’. Colours available are navy, maroon and milo green. They can be viewed athttp://postimg.org/image/rqdf00mqh/. Orders for these 2 shirts can be made viahttp://tinyurl.com/geogteeorders2014. The size chart can also be found there. Each shirt costs $10, the cheapest in history! This year, on top of cotton, we will also be offering the dri-fit option. However, it will only be offered if there are more than 50 dri-fit orders per shirt. We will contact you after the submission of orders to inform you if the dri-fit option will proceed. If it doesn’t, you will be able to switch to cotton. Once you fill in the form, you will be required to submit your cash payment during our payment collection periods. More details about payment collection will be announced at a later date. Please note that ALL orders will close on 17 October 2014 (Friday) at 11.59pm. Looking forward to seeing the shirt orders roll in! The destination for this year's OFT is Shanghai! Join us from 13th-19th December 2014 as we travel to a city where the leading edge of urban modernity blends into a colonial and communist past, home to China's high finance and fashion scenes and an evergreen backdrop for Chinese cinema. Come along, make friends and get to know more Geography majors! 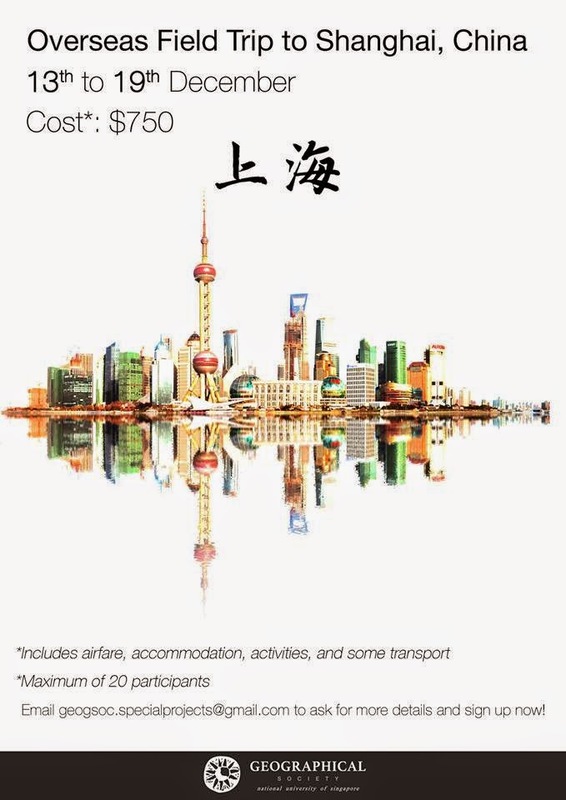 The 5D6N trip (the nights of the 13th and 18th will be spent flying) will include visits to famous Shanghainese sites such as the Bund, People's Square and the French Concession where history, society and politics shape urban space. We're looking at meeting expatriates in Shanghai running walking tours to find out about the city and their lives in globalised space. We'll also take a day trip out to the city of Huangzhou by bullet train to look at issues of domestic tourism. There'll be free time for you do some shopping on Nanjing Road, no worries. And yes, there will be xiaolongbao. The cost of the trip is $750, which includes airfare, accommodation, some transportation costs and entrance/activity fees. 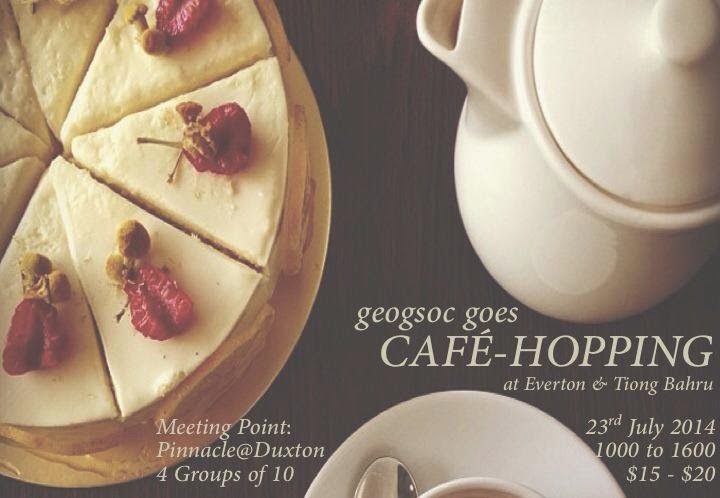 To sign up or ask questions, drop us an email at geogsoc.specialprojects@gmail.com. Registration ends on Wednesday, 8th October 2014 at 9pm. Looking forward to seeing you sign up! Cheers! *Shanghai came in second to Myanmar in the poll we conducted, but we were unable to plan a comprehensive trip in the time we had left to December. That said, we are looking at doing a second OFT during summer break, so stay tuned! 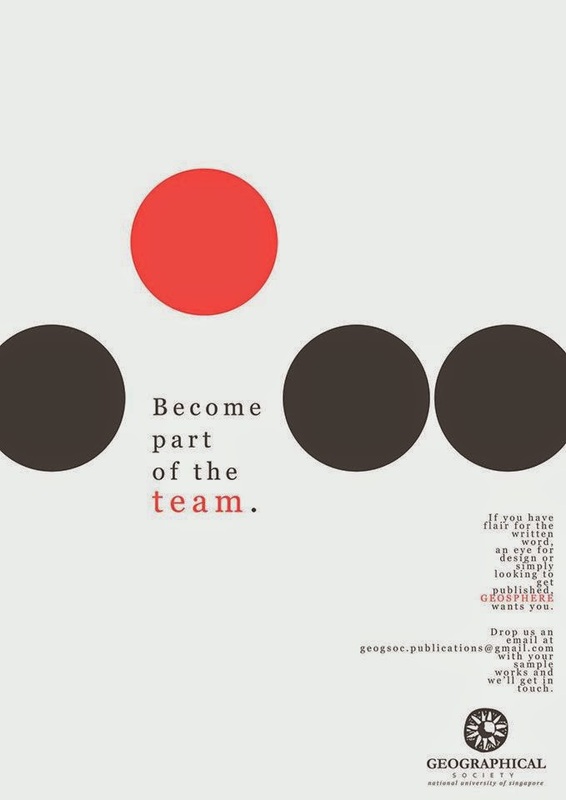 Recruitment for writers and designers for Geosphere is still open! If you think you did a really great paper for some of your modules and want to turn that into an article, or simply have something interesting you want to write about, do drop us an email at geogsoc.publications@gmail.com! All are welcome to apply, and no experience is needed! P.S. Have a good first day back at school everyone! Want to know good places to get your caffeine fix and to hang out with friends? FIC and Majors' welfare cell have a cafe-hopping outing just for you! Comment below to let us know if you're coming! Hope everyone had a wonderful summer break As summer comes to an end, a new and exciting semester awaits us! 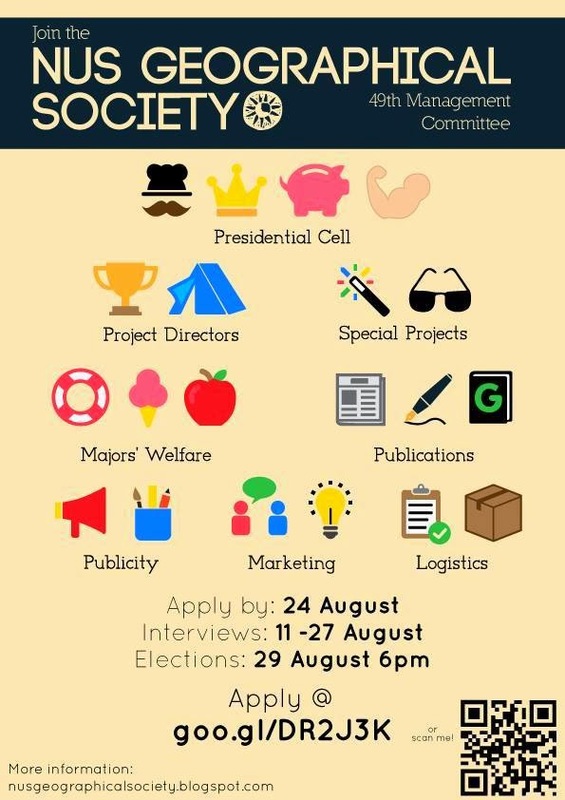 With every ending comes a new beginning, NUS Geographical Society would be beginning its recruitment for the 49th Management committee starting today! To apply for the 49th Management Committee, please click goo.gl/DR2J3Kand fill in the online application form. Do note that the deadline for application is on 24 August 2014 (Sun) at 12NOON. However, do apply earlier to avoid a rush at the end. If you have any queries over the roles and responsibilities/ commitment level/ application process etc and/or face any difficulties in accessing the links above, please feel free to contact us at nusgeographicalsociety@gmail.com. Last but not least, on behalf of the 48th MC, I would like to thank you for all the support and help you have provided us throughout the entire AY. We sincerely hope that you have enjoyed the activities and initiatives organized by the society and will continue to take part in the various events we organize Geogsoc events would not have been a success without you guys! Meanwhile, enjoy the last of your summer break and we look forward to receiving your application for the new management committee! 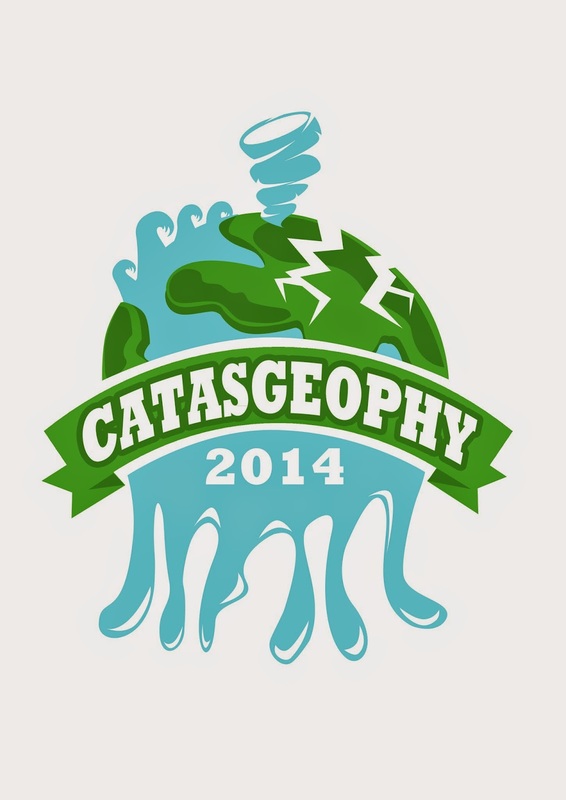 FIC 2014: Catasgeophy '14 - Registrations are open! Geography Freshmen Immersion Camp 2014 entitled "Catasgeophy '14, That's what geographers are for!" will take place from 10th July 2014 to 13th July 2014. To register for this camp, simply follow the following 3 steps! Step 1: Indicate your interest by sending us an email at geogfic2014@gmail.com, we will then send you the forms you need to fill up. Step 2: Print, complete and sign the 3 forms, Personal Particulars form, Declaration of Swimming Ability form and Indemnity form. Step 3: Physical submission will be on 14th June from 1100H to 1700H at Raffles City Shopping Centre (City Hall MRT) Starbucks. 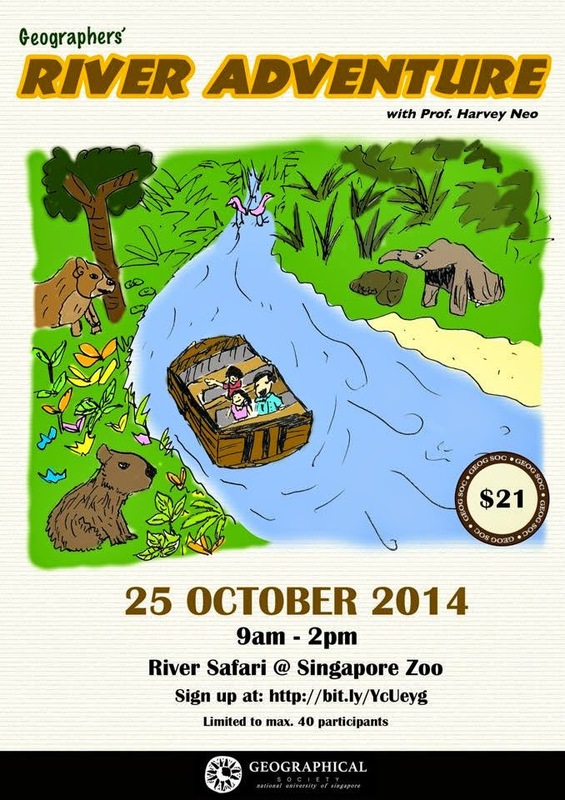 Simply bring along the 3 forms that you have filled up, photocopy of NUS acceptance letter and $50 cash for camp fees. We promise to bring you a memorable experience, a camp where you lasting friendships will birth forth! So, we hope to see you during registration day! Should you have any queries, simply drop us an email at geogfic2014@gmail.com as well. 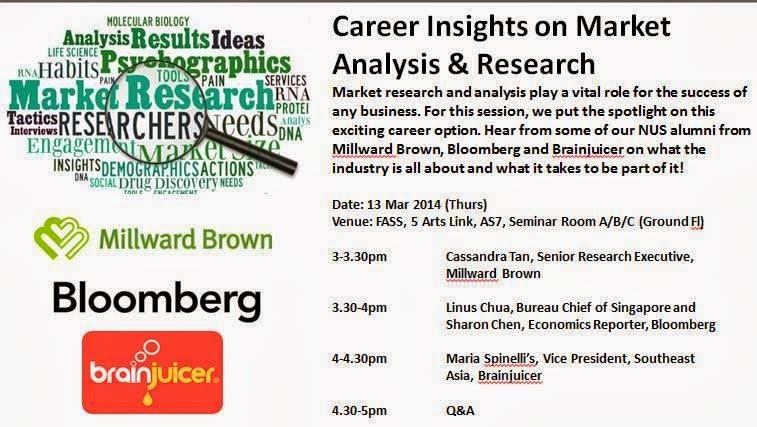 You are all invited to the FASS Career Day 2014 (Thursday 13 March 2014, at AS7 Seminar Rooms A/B/C; dinner included around 7.30pm!). Please see the poster below for 3 events all on the same day: (a) a talk by HR Personnel on Recruitment; (b) seminar on Working as a Market Analyst/Researcher; and (c) chat/mingle session with 17 FASS Alumni. If you are pressed for time (who isn’t on Week 9 of the semester? ), may I strongly encourage you to come for the last event: ‘Speed Mentoring Evening with FASS Alumni’ (6.30pm onwards) where you will meet with 17 FASS Alumni to find out more about their work at DBS, MINDEF, National Heritage Board, Google Singapore, SATS Ltd., teaching, Prudential, McKinsey etc. Of the 17 alumni, three are Geography graduates working at SATS, Ministry of Education, and as a school Principal. Please register for the event (see poster) and come at 6.30pm to listen to all 17 alumni and enjoy a free dinner too! Event 1: A rare opportunity to peek into the brains of the HR folks taking care of recruitment. Expect to hear from 2 very well experienced HR veterans with hiring experiences across industries (Banking, Tourism, F&B!) what should a job applicant do to capture the eyes of the recruiters, and learn the latest recruitment trend amongst HR practitioners. Gather these information to formulate your winning job search strategies. Event 2: A spotlight on the career that utilize the skills that FASS students are well equipped with. Many of you wanted a job that allow you to apply what you have learnt. A market analysis/market research job employs the analytical, critical thinking skills and communication skills you have well-honed during your NUS days. At least 2 Market researchers/analysts will be present to share with you the works of the profession, rewards, challenges, daily operations, tips and tricks of the trade! Online registration is required for attendance. Please click on the respective links below to register your attendance for the events by 12 March 2014, 3pm. 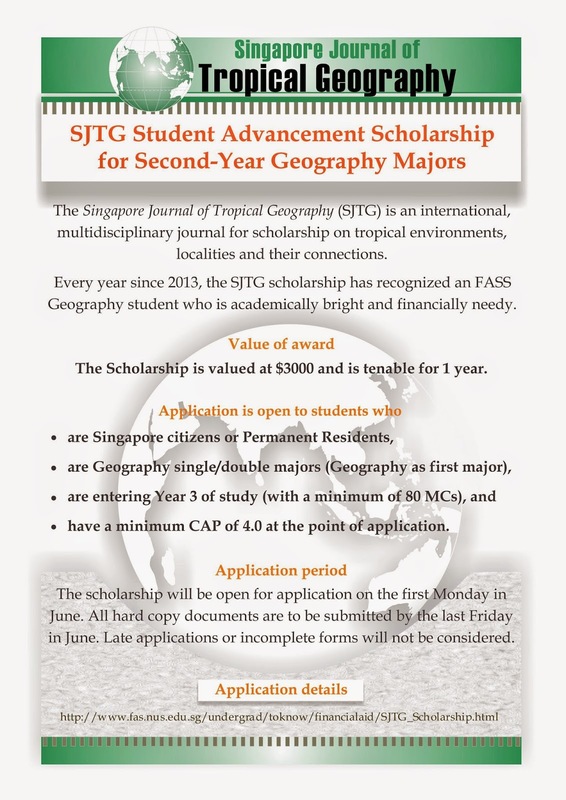 Application for the Singapore Journal of Tropical Geography (SJTG) scholarship will be open on the first Monday of June! SJTG scholarship is awarded to Geography majors who are academically bright and financially needy . Do note that this is only applicable for current Year 2 students going on to Year 3. Year 1 students do consider this next year! *To all Geog Majors, Jurong International is giving a talk today at 3pm, AS7 seminar room. This talk would be beneficial especially to those who are interested in urban planning and wish to know more about Jurong international. See you there!